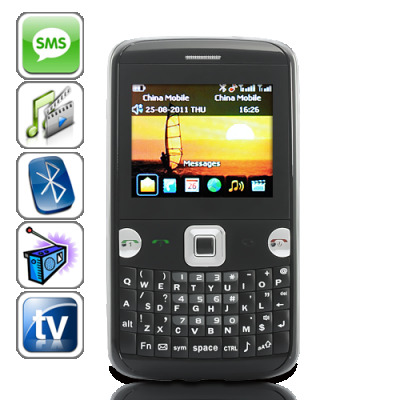 Successfully Added AirMileFone - Quad Band Dual-SIM Cellphone with QWERTY Keyboard to your Shopping Cart. With its clean and functional design, powerful functions, and a convenient QWERTY keyboard, the Airmilefone is made for the busy business professional - people who travel around the world to close lucrative business deals, and yet keep a fine balance between life and work. One Extra SIM Slot Makes a Huge Difference: If you are heading for a remote nameless country to escape the law or come to China to invest in the exploding real estate market, make sure you have the Airmilefone Dual-SIM cellphone. With two SIM slots, you can use one for home country SIM card and another for international pay-as-you-go or local SIM card. Making calls on your trip will be so much cheaper! With one additional SIM card, you can have different numbers for different people. One for family, close friends, and the other one for business partners, colleagues, acquaintances, etc. Keep your private number truly private is never so easier! More Features Than You Expect: The Airmilefone will completely change the way you think about low price phones. It comes with a dazzling array of features, including: A camera and camcorder, video and music player, FM radio and e-book reader, analog TV, Bluetooth for hands free phone calls, full QWERTY keyboard for comfortable typing, and much, much more. With the Airmilefone, you will have even more reasons to love your phone. Best Deal on the Market: At a price of below 50 dollars (even lower in bulk), you really can’t go wrong with the Airmilefone. Thanks to our sourcing team we are able to offer you products at unbeatable wholesale price yet at the same time keep a high quality level. Add to cart now and your order gets shipped within one day! Brought to you by the leader in direct from factory electronics, Chinavasion. As the wholesaler, Chinavasion does not provide customer support for GPRS or WAP setup. Instructions are available from your cellular service providers’ website and service centers. If you have further questions then we suggest you visit forums and community websites such as [http://forum.gsmhosting.com/vbb/]. This is a great way to find other users from your region that have already posted information regarding almost any question and answer you may need. i want to work and i will see .perhapes this method is very good.